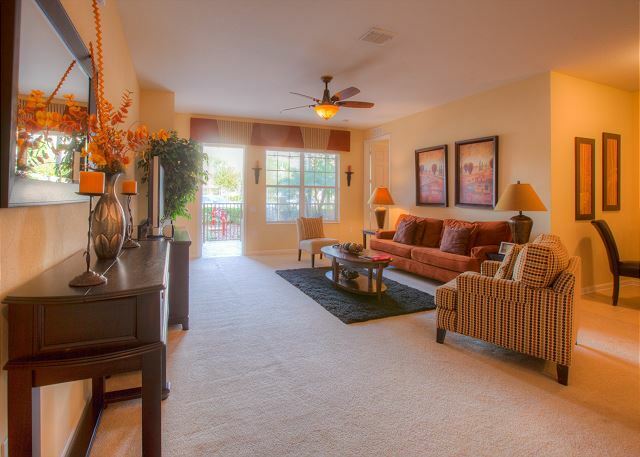 Escape to sunny Florida and stay in the luxurious Orlando Escape condo in the Vista Cay Resort. 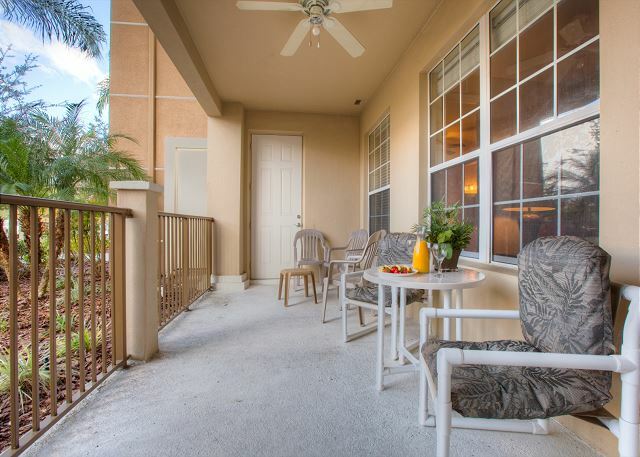 The ground-floor location makes getting in and out a breeze, and is perfect for busy vacationers on the go. 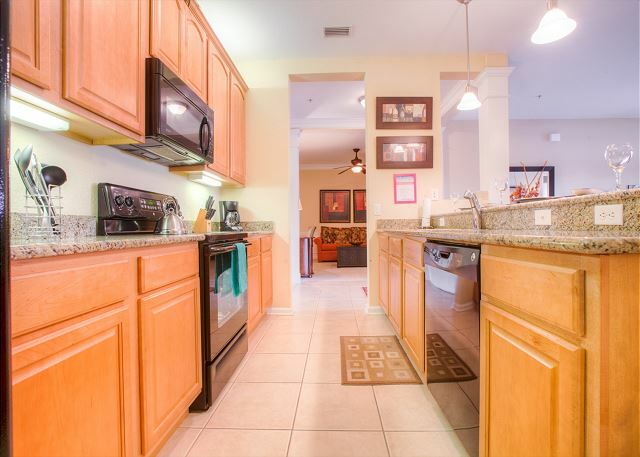 A fully-equipped kitchen with granite countertops will make meals or entertaining a joy to prepare, and the cozy dining room and breakfast bar can seat seven guests. Relax in the modern decor of the comfortable living area, complete with 42-inch TV and home theater system. 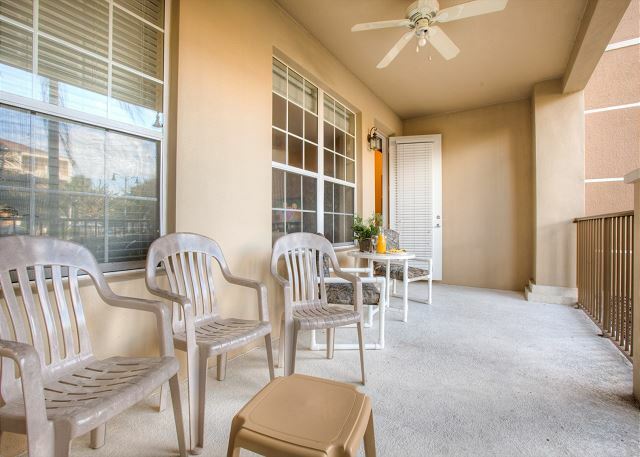 Right outside the living room is an airy patio with furniture, making this a great place to catch up with friends and family. A cozy den offer quiet space for working at the desk (complete with printer) or catching up on your new novel. 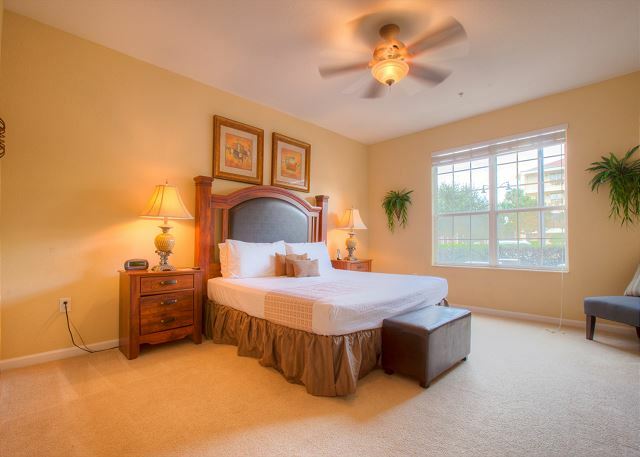 The master suite includes a lush king bed and spacious bathroom en suite, with his and her sinks, a grand soaking tub and a large walk-in shower. 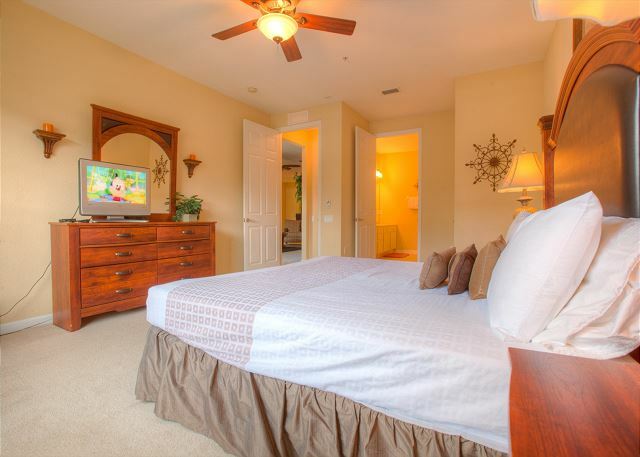 The master suite also includes a 26-inch flat screen TV with DVD player. 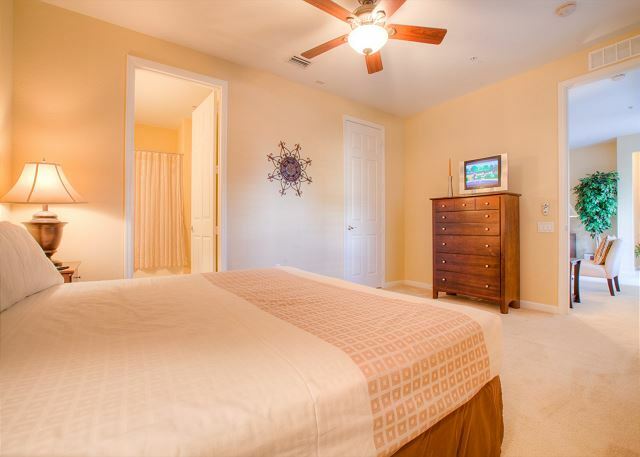 The second bedroom also has a king bed and a 20-inch flat screen TV with DVD player. 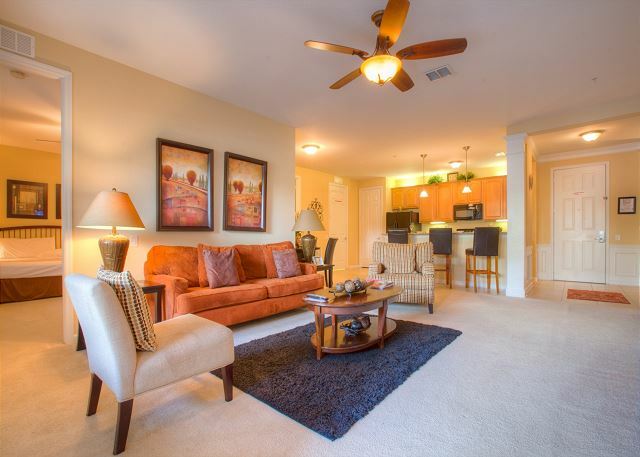 A queen sleeper sofa makes the den a quiet space for extra guests, making Orlando Escape perfect for accommodating up to six vacationers. 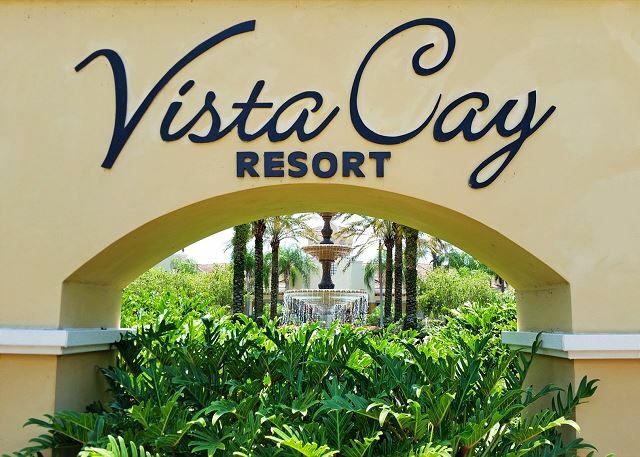 Vista Cay Resort is right next door to the convention center, and less than 15 minutes away from all major theme parks, including SeaWorld, Universal Studios and Walt Disney World. It was a spectacle, everything very good, the place is fantastic, close to everything, best of all is that everyone felt at home, the check in and the express check out facilitated a lot, everything was clean and organized with all We'll be sure to choose the next one again." "We have a very nice experience. The apartment was clean and everything was working. The only think that need urgent repair is the bed and the pillows, that was extremely soft (not in a good way). We almost reach de floor. Beside that, everything was fine." "very nice comunity, very clean! Perfect stay for my family. 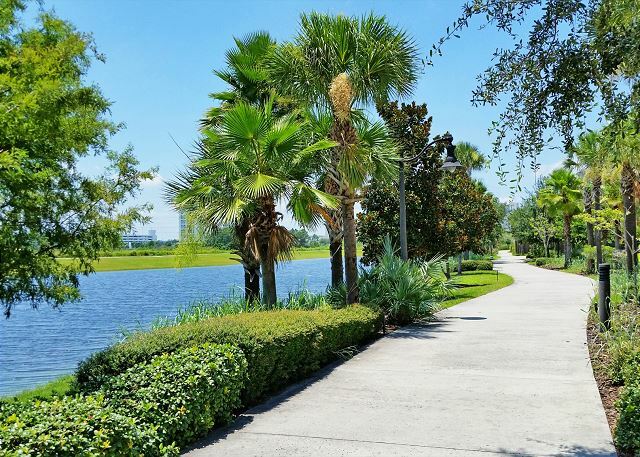 Very close to all attractions!" "The place was great but wish they had more toilet paper. Also, it would be nice if they gave a list of consumables they have and don't have. Such as coffee filters." 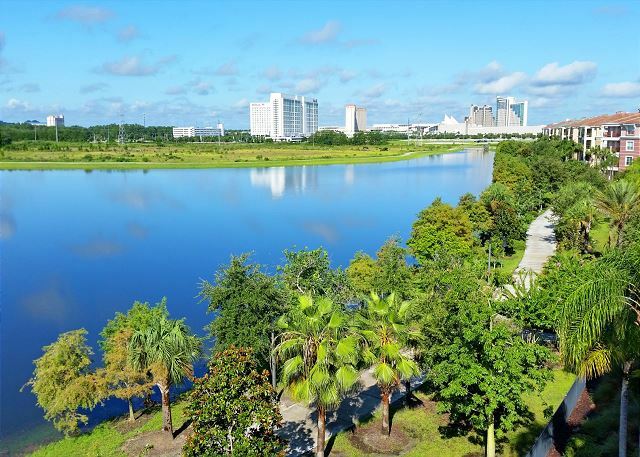 "Convenient location to the Orlando Convention Center. Unit was clean but had some stains on the carpet. One of the side chairs was missing, so sitting 3 on the couch was a little tight. Overall we would stay here again." "Nice place and clean "
"We chose this rental due to its proximity to the Orange County Convention Center so that we could walk in stead of paying for parking at $10/day. The walk is very do-able for adults or families with older kids, but I wouldn't recommend it for youngsters because of the road you need to cross and having to cut through certain ares to make it relatively safely. The room itself was fine, Not sure I would classify it as "luxury" but it was clean and spacious. We had two issues. First, VIP passes were needed to access the pool which is fine, but your checkin info email stated we would have 4 passes and we only had 3. Also fine, except that one didn't work, and the email clearly states if any are lost we would be charged for the loss. After calling the office, we were informed that the passes are now complementary and they don't charge for them anymore. Second, the beds were awful. I spent the first night on the couch because the bed was so hard and squeaked every time I moved. This was immediately rectified by management by providing memory foam mattress toppers for both beds. That solved the problem enough that I was able to sleep comfortably the 3 other nights of our stay. So overall a decent place, in terms of quality, the furniture was comfortable, the kitchen well stocked,the bathrooms very spacious and clean, but the carpet really needs replacing as it was stained and loose. Walls could use some touch up paint due to scuffs. I would stay again especially for a long stay as it was much better on our family of 4 than a hotel room would have been." 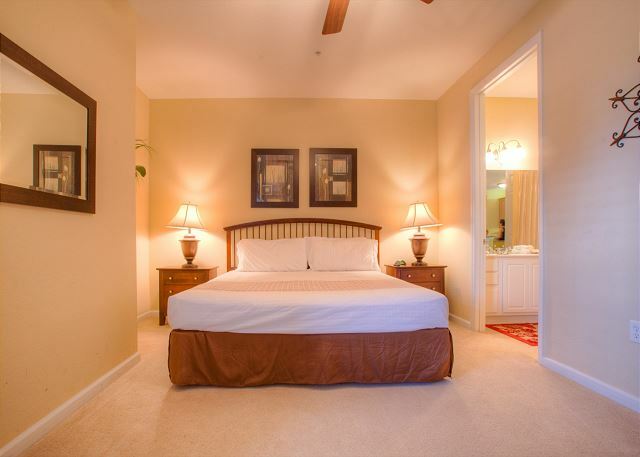 "The condo is very spacious and perfect for 2 couples. 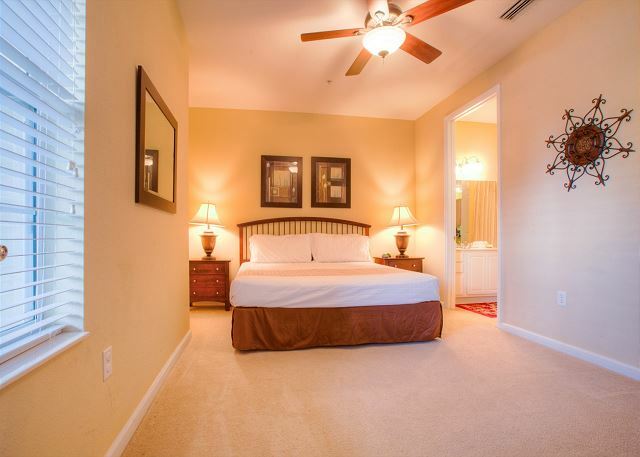 While everything was very clean, the carpet and sheets were well worn and needed replacement. Convenient to drive or use ride services to the parks! " 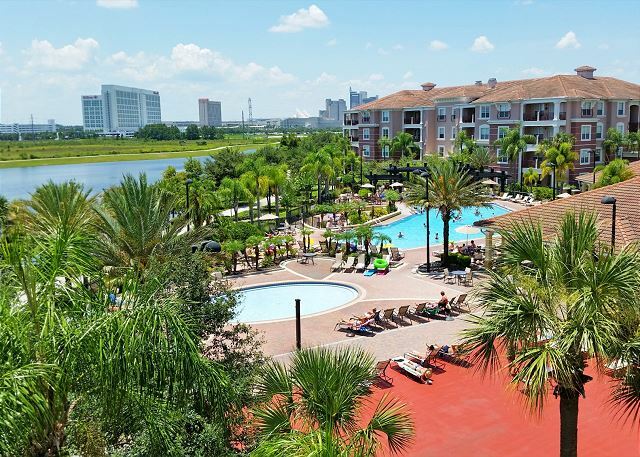 "Our stay in Orlando Escape was superb. The only downside was the apartment balcony view was onto the car park and as the apartment was on ground level there was a water hydrant at eye level view.this was only a minor point though and did not detract from the overall experience. 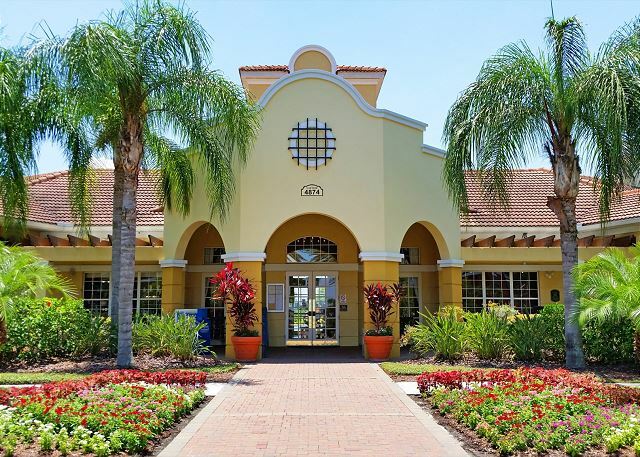 The cleanliness and facilities provided were excellent and I will definitely itself return to this location and use the services of Casiola vacations." 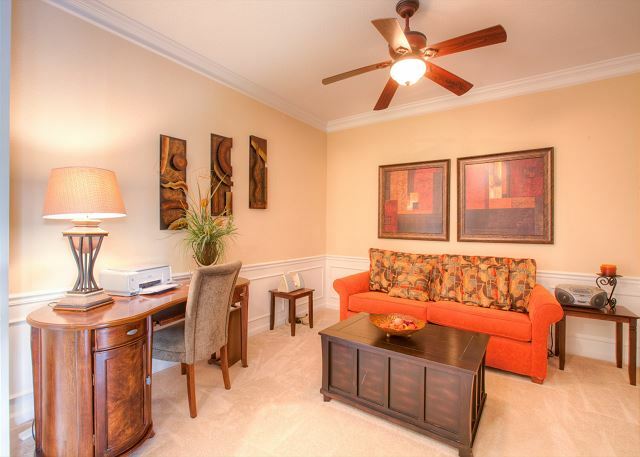 "The condo was super big & elegantly furnished. 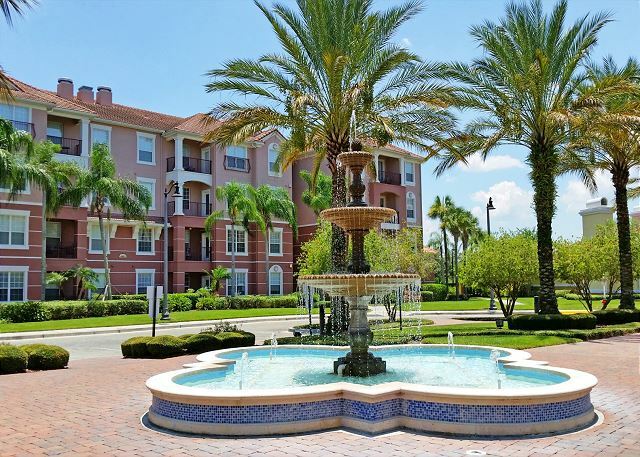 Very convenient location with access to shopping & restaurants. Only down side was both king sized beds aren't very comfortable. Other reviews had stated the same thing. Owner of unit should look into making such a small investment in order to receive excellent feedback. " 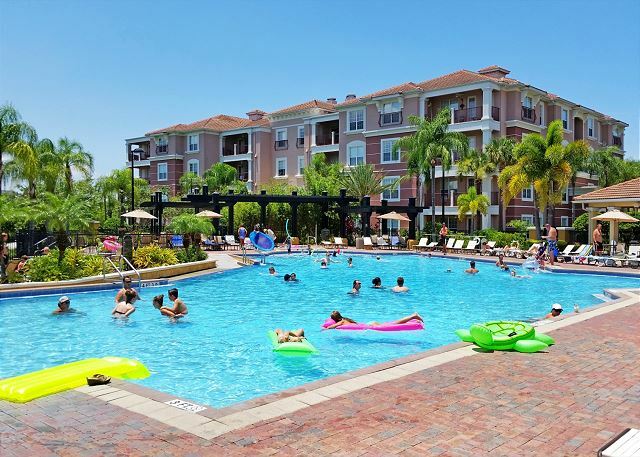 "This HUGE condo was a great location for a quick trip to Orlando with one of my daughters and my grand-daughter. They loved the pool and hot tub while I took care of other matters. 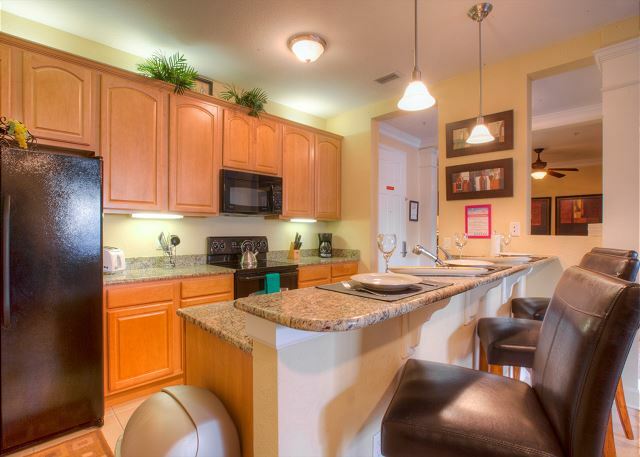 Very convenient to Disney Springs, Magic Kingdom and a variety of other entertainment. Only one hour to the beach, which enabled us to take a quick trip. The rental folks were quite pleasant, and we appreciated the details such as little rosettes folded with paper products. Beds were comfortable, and everything worked. Three small items: Icemaker was jammed and overflowed. We cleaned out and it worked find but might want to watch. The white chair in the living room has a large, unsightly stain. Might want to clean or toss. These are very minor bits. Light sleepers on the first floor, as we were, might want to bring ear plugs or use a white noise app on phones. 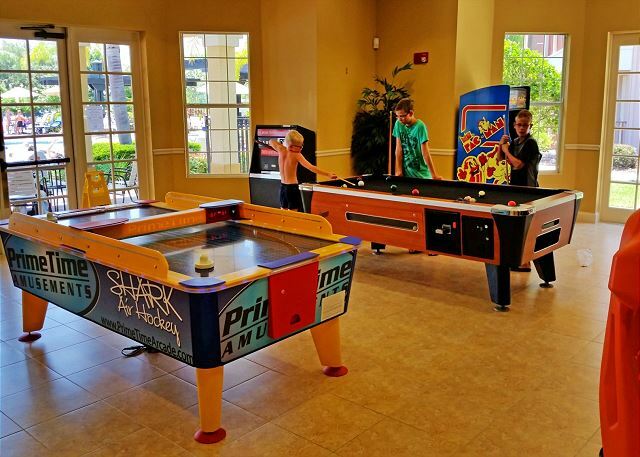 Again, these are minor items and overall we enjoyed and would stay again." 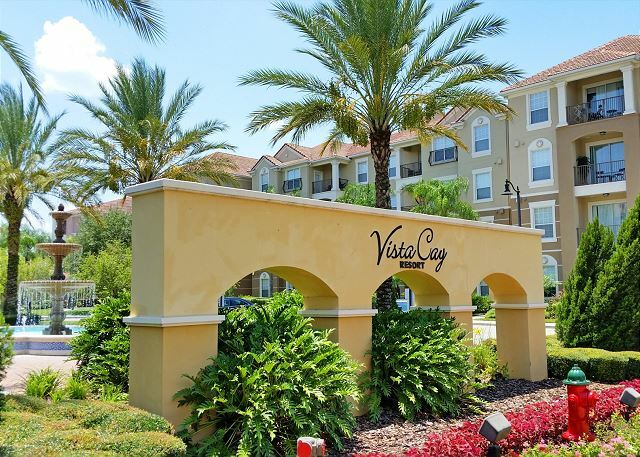 "We had past experience of staying at Vista Cay, knowing it was close to convention center was a big draw, and easy access to many Orlando attractions. This condo was OK, but not one I would choose in the future. It has a tired appearance with some furniture staining, bathroom cupboards with pealing paint, and the ground floor view out to the parking lot with 4 heat pumps right outside the master bedroom window was a real negative. The major objection to this condo was the lack of quality sleep because of the brightness all night in the master bedroom. There is a large property security light right outside the master, and with the flimsy white plastic blind on the window, it's impossible to block out much light. The solution of a simple black out drape would make all the difference in the world, and we were shocked to think this had never been addressed. 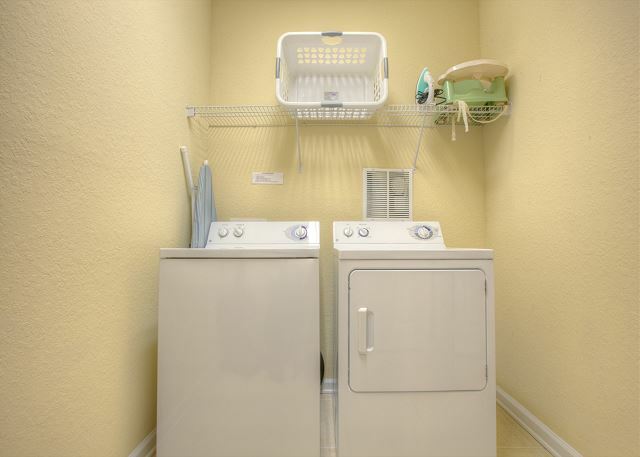 We thought for a budget rental the condo was fine, other than the bedroom issue. (light & heat pumps) The condo was clean and the process for renting was easy and efficient. 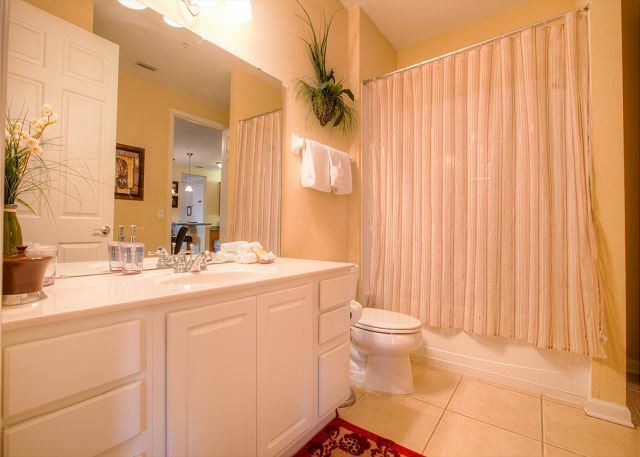 It seems very skimpy to us to find only 1 roll of TP per bathroom. Since paper products were of poor quality, I'd think at least two per bathroom would be appropriate. Location was convenient, view was zero, safety seemed totally fine. 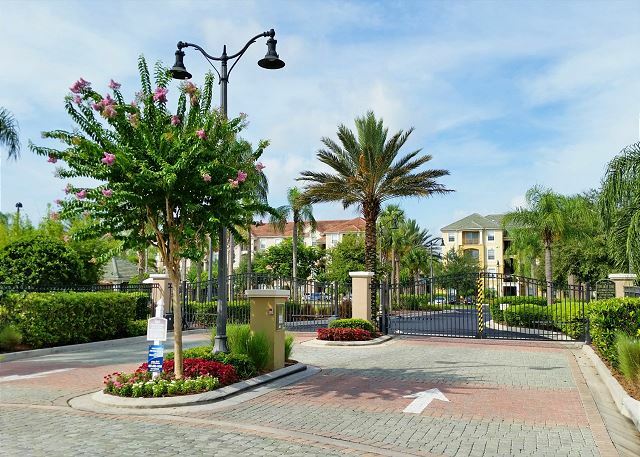 I would definitely recommend Vista Cay to others, not necessarily this particular condo unless they were with small children and didn't want to worry about a place being too nice. It is quite close to the pool, and ground floor makes for easy coming and going. I will look for lake view side next time, as the little lake is a real plus. We enjoyed walking around it each day and seeing all the many different types of water foul. " 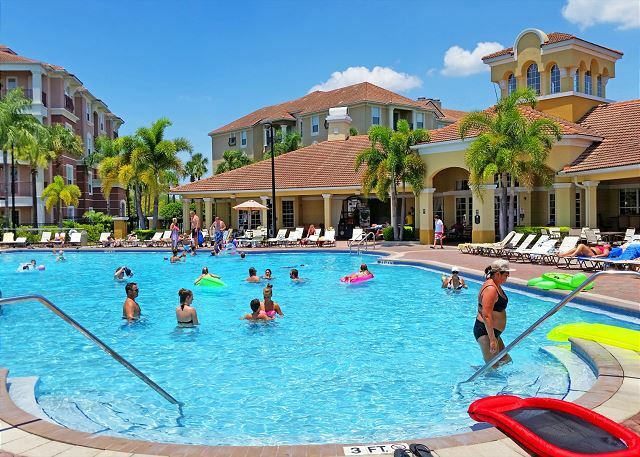 "The place was even better than what we expected, great location close to everything, super clean, cheerful and has everything we needed, the resort is very nice and has a very nice club house and pool. the whole experience was wonderful i would deff rent there again if i went to Orlando. one comment, the TV was too complicated." 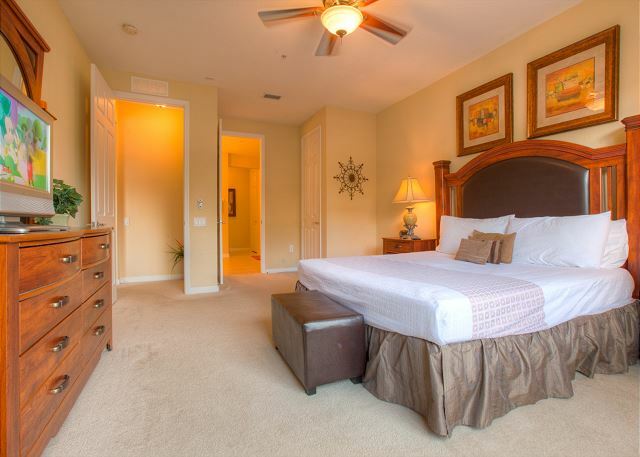 "We cannot recommend casiola vacation homes enough! We had an amazing vacation in Orlando and will definitely be returning again soon. 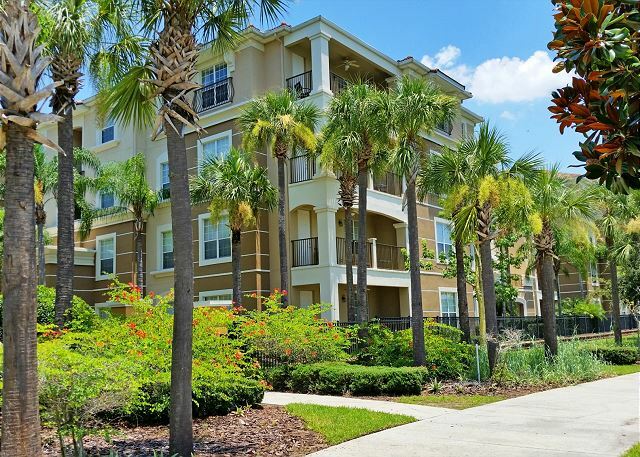 Casiola had everything we needed to make our stay perfect, the apartment was very clean and had all the facilities we needed to use. 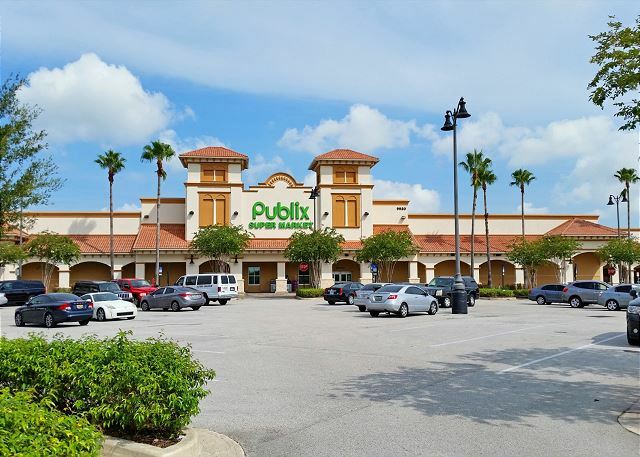 The nearest supermarket was about a 10 minute walk and also a 10 minute drive if you wanted to go to international drive." "So much more affordable and comfortable than a hotel." "Amazing, exciter, incredible place for relax and where we'll back on our next Vacation.."
"everything is ok except the wet smell in this room, maybe is caused by 1th floor, and window open ,so no fresh air coming." 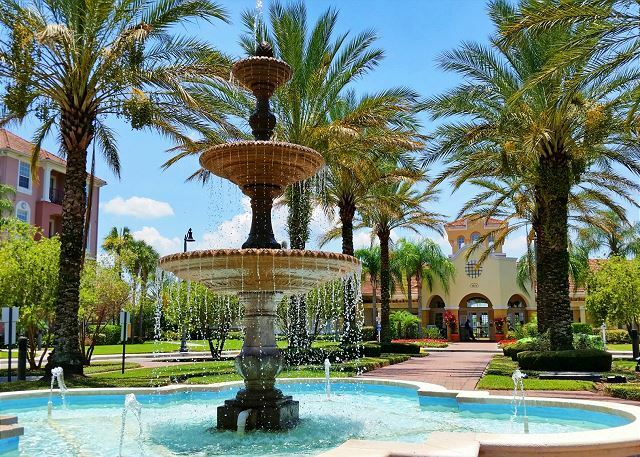 "exceeded our expectations / very clean /5 minutes away from our convention/ great value"
"Vacaciones familiares en Orlando Escape,seguridad, privacidad,aseo,parqueo muy cerca de los parques de diversión,bares , restaurants, atención con personal bilingue." 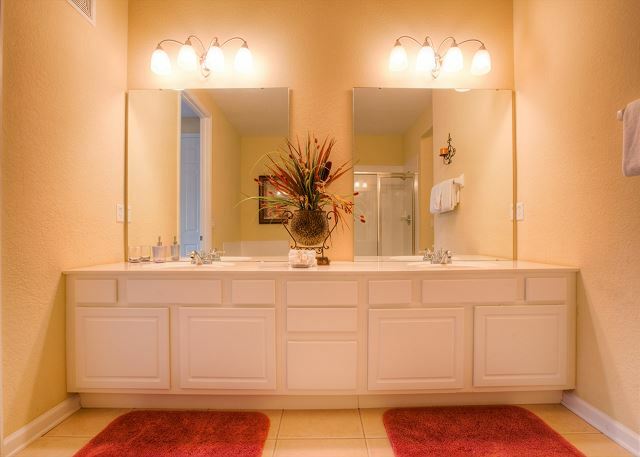 "As a family of five, two adults and three children this vacation home was perfect for us. 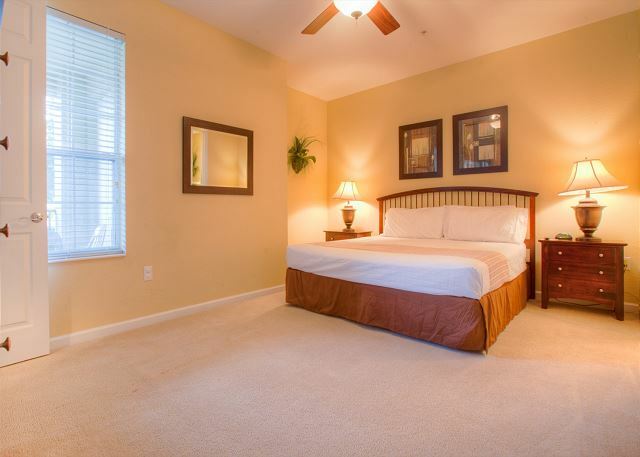 It was spacious and very clean and also very well maintained. When bookin I did ask for a lake view but we got the car park view but it didn't mater we were not to worried. The location was great for us but you definatly need a car which we had. 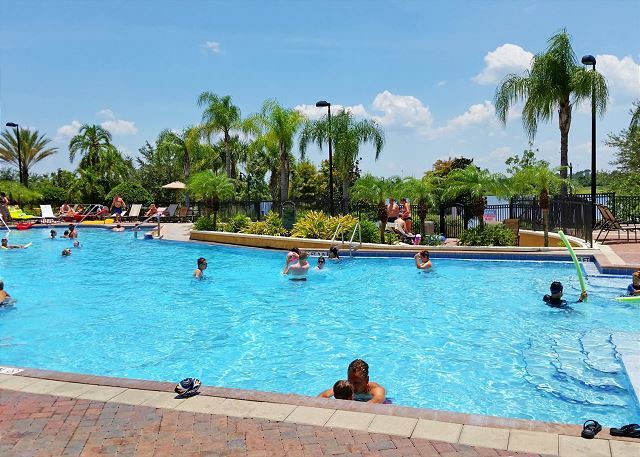 The pool was great and staff friendly too I would definitely recommend theses homes to friends and family and hoping to return next year."